GERMANTOWN, MD--(Marketwire - Feb 7, 2012) - DPR Group, Inc., a full-service communications agency providing public relations and marketing support services to a broad range of technology companies, announced today that Chapman Cubine Adams + Hussey (CCAH) has selected the firm to provide strategic public relations services. DPR Group will promote CCAH as one of the nation's leading providers of multi-channel direct marketing for non-profit organizations through enhanced messaging, local and national media relations and thought leadership campaigns. Kim Cubine, president of CCAH, said, "We chose DPR Group due to the company's successful track record of generating strong public relations for direct marketing companies. As an established multi-channel direct marketing company, we look forward to working with DPR Group to help expand our messaging across local and national channels and showcase our unique services." For more than 25 years, CCAH has been on the forefront of the ever-changing direct marketing industry with award-winning innovations in direct mail, telemarketing, online and mobile integration. The company's team of seasoned strategists and creative developers has delivered results for some of the largest and most recognized non-profit organizations worldwide. CCAH has offices in Arlington, Va., and San Francisco. DPR Group founder and president Dan Demaree said, "We are excited to be working with CCAH, one of the most innovative and highly respected direct marketing agencies for non-profit organizations. Through our focused public relations efforts, we will be helping CCAH promote their services in order to achieve greater visibility in the marketplace." DPR Group is a full-service agency that specializes in providing public relations and marketing support services to a broad range of technology companies. Founded in 1998, the firm has a proven track record representing both privately held and publicly traded companies in fields that include software development, systems integration, telecommunications, electronics and component manufacturing, consulting and specialized services. With offices near Washington, D.C. and in Cary, N.C., DPR Group has the experience and industry contacts to successfully launch new companies and products and to significantly increase the name recognition of larger, more established companies. For more information, call 240-686-1000 or visit: www.dprgroup.com. 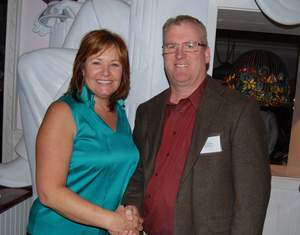 About this company DPR Group, Inc.
Kim Cubine, President, CCAH (Left) and Dan Demaree, President, DPR Group (Right) at the CCAH holiday party.